Set in Bangkok, within 800 metres of Khao San Road and 1.6 km of Temple of the Emerald Buddha, Villa Cha-Cha Rambuttri provides accommodation with a bar and free WiFi. The property is close to several noted attractions, around 1.9 km from Grand Palace and around 2 km from Temple of the Golden Mount. Wat Pho is 2.7 km from the property. The rooms in the hotel are equipped with a kettle. Rooms are complete with a private bathroom, while some units at Villa Cha Cha Rambuttri also offer a terrace. Guests at the accommodation can enjoy a continental breakfast. Guests can grab a bite to eat in the in-house restaurant, which serves a variety of Seafood and Pizza dishes and also offers vegetarian options. Guests have access to the on-site business centre and can use the on-site ATM machine. Staff at the 24-hour front desk can provide tips on the area. Dusit Palace is 3.3 km from Villa Cha-Cha Rambuttri. 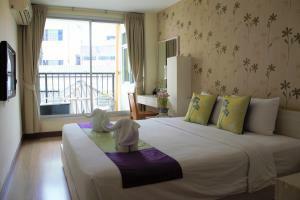 The nearest airport is Don Mueang International Airport, 26 km from the hotel. Guests staying at this property have a free access to the swimming pool located at Villa Cha Cha Banglumphu. Please inform Villa Cha-Cha Rambuttri in advance of your expected arrival time. You can use the Special Requests box when booking, or contact the property directly with the contact details provided in your confirmation. Guests are required to show a photo identification and credit card upon check-in. Please note that all Special Requests are subject to availability and additional charges may apply. 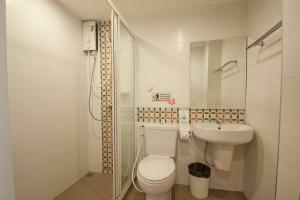 A damage deposit of THB 1500 is required on arrival. This will be collected as a cash payment. You should be reimbursed on check-out. Your deposit will be refunded in full in cash, subject to an inspection of the property. 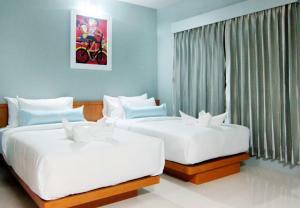 Rate: THB 1040.00 ... THB 2450.00; select dates below to get current rates. 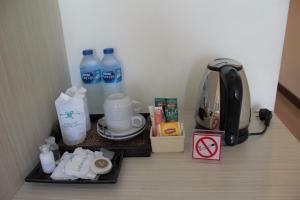 This double room has a seating area, minibar and electric kettle. 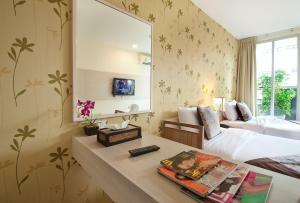 Rate: THB 1057.93 ... THB 2281.03; select dates below to get current rates. This twin room has a minibar, electric kettle and air conditioning.